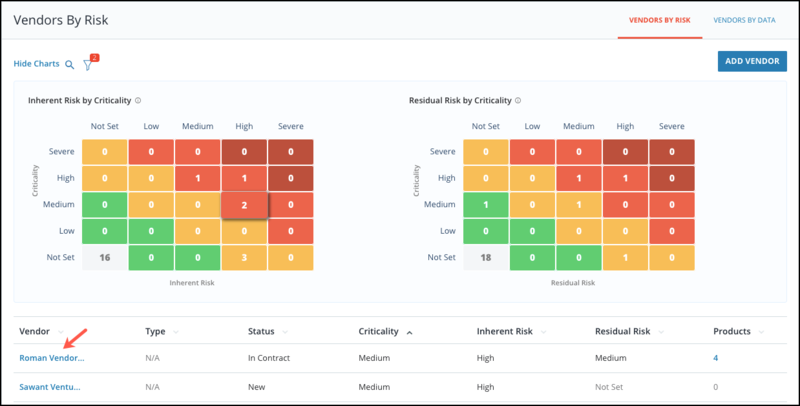 Users now have a Risk Dashboard displaying the Severity, Inherent Risk, and Residual Risk across all their vendors. The Inherent Risk by Criticality heat map shows the number of Vendors Products of a specific Inherent Risk Level broken down its Criticality Level. For example, a Product with higher Criticality and Higher Inherent Risk Level will be of a darker red color and towards the top-right area of the heatmap, vs a Product with lower Criticality and lower Inherent Risk Level. The Residual Risk by Criticality heat map shows the number of Vendors Products of a specific Residual Risk Level broken down its Criticality Level. For example, a Product with higher Criticality and higher Residual Risk Level will be of a darker red color and towards the top-right area of the heatmap, vs a Product with lower Criticality and lower Residual Risk Level. 1. Navigate to the Vendor Space as shown above and click on the Vendors by Risk link. 2. Here, you can view the Inherent Risk by criticality as well as the Residual Risk by criticality matrices. Users can easily search for vendors or apply filters on the top left. 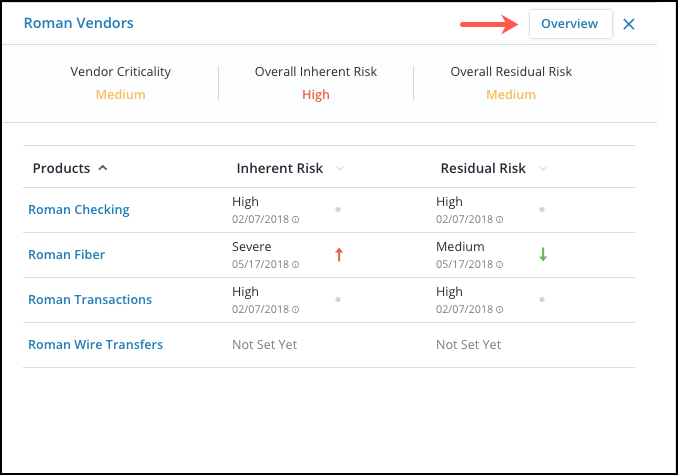 Users can also click on the Inherent Risk by Criticality or Residual Risk by Criticality chart to see vendors associated with a specific severity level. Users will have a new table with a Quick View interaction to show a vendor's Inherent and Residual Risk by Vendor or Product. To begin, click on the specific vendor to open the table. From here, the Quick View table will show the vendor's criticality, overall inherent risk and overall residual risk associated with their products. Users can continue to dive deeper into vendor by clicking on the Overview button as shown above. From the Overview screen, users can track risk changes at the product level using the Inherent and Residual Risk charts available at the product level. To learn more about Vendor Overview, click here.